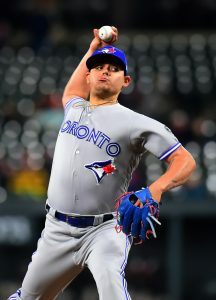 The Astros have struck a deal to acquire relief pitcher Roberto Osuna from the Blue Jays, as Ken Rosenthal of The Athletic first reported (links to Twitter). Former Astros closer Ken Giles is heading to Toronto along with righties Hector Perez and David Paulino. The Jays announced that they’ve designated righty Oliver Drake for assignment and moved Josh Donaldson to the 60-day disabled list in order to clear roster space for Giles and Paulino, each of whom is on the 40-man roster. This is a rather jarring swap that’ll surely ignite quite a reaction. Both of these pitchers have been working at Triple-A recently, for rather different reasons, despite generally excellent track records in the majors. Osuna is currently pitching on a rehab assignment while serving a suspension under the MLB-MLBPA Joint Domestic Violence, Sexual Assault and Child Abuse policy. He is also still facing domestic assault charges in Canada for alleged crimes against his girlfriend. Up until his arrest in early May, Osuna was widely regarded as one of the game’s most exciting and valuable young relief pitchers. He was in typically excellent form to begin the present season, as he has been ever since breaking into the majors at the start of 2015. Osuna has worked as the Toronto closer for much of that time, accumulating 104 saves in 223 innings. Despite the fact that Osuna is still in legal limbo for a despicable alleged crime, the defending World Series champions have decided to add him to their relief corps. The 23-year-old will be eligible to return from his suspension on August 5th and will not be precluded from participating in the postseason. (Unlike the rules involving players banned for PEDs, domestic violence-related bans do not come with limitations on the playoffs.) That said, his legal situation could still theoretically impact his availability, owing to trial involvement, potential prison time, and travel issues. Houston GM Jeff Luhnow and Osuna have each released statements (via Mark Berman of FOX 26, Twitter links). Luhnow says the team is “confident that Osuna is remorseful, has willfully complied with all consequences related to his past behavior, has proactively engaged in counseling, and will fully comply with our zero tolerance policy relate to abuse of any kind.” Notably, there’s no specification of just what “past behavior” is at issue. Osuna, meanwhile, stated that he is excited to play for the team, but did not even reference his alleged malfeasance. As for Giles, 27, his recent problems have been tied more closely to his performance on the mound. He had maintained a typically strong mix of strikeouts and walks (31:3) in his 30 2/3 innings to open the season and only allowed a pair of long balls. Yet Giles was also tagged for 17 earned runs on 36 base hits. The struggles came to a head earlier this month, as Giles was pulled from an appearance and perhaps offered some choice words for his skipper. Regardless of just what happened, the decision was made that some time in the minors was on order for a reliever who had limped to a 4.99 ERA. It didn’t help, surely, that Giles struggled during the Astros’ World Series run. There’s still plenty to like about Giles, of course. He’s averaging about 98 mph with his fastball and maintaining an excellent 16.4% swinging-strike rate, in line with his career numbers. He has never before been so stingy with free passes. While there has certainly been a rise in the hard contact Giles has surrendered, the tools seem to remain in place for a turnaround. Though the two players’ once-similar paths have diverged in other ways, they remain a near-perfect match in terms of contract situations. Both are headed for free agency after the 2020 season. Giles is earning a bit less than Osuna this year ($4.6MM vs. $5.3MM), but those salaries will likely even out this fall since the former will have logged quite a few more MLB innings than the latter. From a baseball perspective, Osuna seems clearly to be the most talented player in this deal. He has no real blemishes on his pitching record and could well be a critical piece of the Astros’ attempt to hang another banner while still maintaining its store of prospect capital. Of course, there’s also an unsavory reason that the club was able to achieve such potential value. It seems the Blue Jays, in the midst of a failed season, decided to get what they could for a disgraced player. Though the team suggested otherwise publicly, MLB.com’s Jon Morosi tweets that the Jays had decided already to trade Osuna rather than allow him back on their active roster. Giles certainly seems a worthwhile player to take a chance on, but the other pieces are notable as well. Paulino will bring his own baggage up north, as his once-bright prospect star faded after a PED suspension last year. He also had bone spurs removed from his elbow last fall and has been limited to seven appearances in the minors. He has allowed 11 earned runs in 18 Triple-A frames, but has also recorded a healthy 23:5 K/BB ratio. Perez is another fairly advanced hurler of note. He has handed out far too many walks during his time on the Houston farm, but has also shown some swing and miss ability. Perez recently moved up to the Double-A level. In 89 1/3 total frames on the year, most at High-A, he’s carrying a 3.73 ERA with 10.2 K/9 and 4.8 BB/9. While there’s obviously some polish still needed, Perez has drawn plaudits from prospect hounds who love his pure stuff and think he could potentially still harness his command enough to make it into a MLB rotation — or, if not, turn into a nice high-leverage bullpen piece. As for the corresponding moves made by Toronto, the DFA of Drake comes as little surprise, given that the righty was only recently claimed off waivers last week and had made just two appearances with the Blue Jays — his fourth MLB organization of the season. He’ll be traded, outrighted or released within the week. Moving Donaldson to the 60-day DL is merely a procedeural move; he’s not expected back until next month anyhow and will have missed far more than the requisite 60 days in total by the time he’s ready for activation. 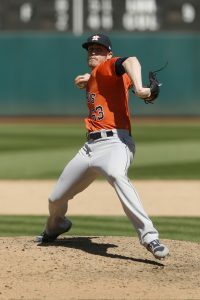 The trade that would have sent Zach Britton from the Orioles to the Astros included third baseman Colin Moran, reports Jon Heyman of FanRag Sports, but medical issues ultimately sank the deal. Moran was already on the disabled list after having suffered a concussion and a facial fracture when he fouled a ball off his face in mid-July, per Heyman, but there were also medical issues with one of the prospects that would have gone to Baltimore. That issue was found as the O’s sifted through medical paperwork, and though Houston tried to resurrect the deal in the final hours leading up to the non-waiver deadline, the two sides were ultimately unable to find a common ground. None of Kyle Tucker, Derek Fisher, Francis Martes, Forrest Whitley or Yordan Alvarez were offered in either iteration of the deal, he adds. The Tigers are “disappointed” in Nick Castellanos’ defense at third base once again, as he’s taken a step back in that regard after seemingly making improvements in 2016. Heyman suggests that Castellanos may be available in trades this winter, and since he’s already cleared waivers, he could technically be moved anytime moving forward. (He wouldn’t be eligible for a postseason roster if he’s traded after today.) Heyman also notes that Ian Kinsler’s preference may be to play for a contender, and the Tigers will again field offers on him this winter after making an easy call to exercise his $10MM option. The Yankees aren’t currently planning on “chasing” Masahiro Tanaka if he opts out of the remaining three years on his deal, with one source telling Heyman that the Yanks wouldn’t offer anything beyond the $67MM he’s still guaranteed. Tanaka has a 3.79 ERA with 116-to-19 K/BB ratio in 99 2/3 innings since May 26 and a 3.32 ERA with 10.3 K/9 against 1.4 BB/9 since the calendar flipped to July. Heyman also notes that the Yankees could also be interested in retaining left-hander CC Sabathia on a one-year deal this offseason. Prior to trading Yu Darvish to the Dodgers, the Rangers “made clear” that they were “completely willing” to trade Darvish to the Astros. The Rangers, according to Heyman, asked for top-tier prospects from their division rivals, however, before ultimately landing on a package comprised largely of high-ceiling players in A-ball. Houston offered currently suspended (PEDs) top prospect David Paulino in a deal, and the two sides apparently never got especially close to reaching an agreement. Even with his recent struggles, Rockies closer Greg Holland still plans to decline his $15MM player option at season’s end in order to retest the free agent market. Holland looked unhittable for the season’s first two months before showing some red flags in June and July (as Fangraphs’ Dave Cameron recently pointed out). Those troublesome trends have caught up to Holland in August, as he’s been torched for 14 runs on 14 hits (four homers) and six walks with eight strikeouts in 9 1/3 innings this month. Left-hander Matt Moore “sailed through” revocable trade waivers when the Giants put him through that process this month, per Heyman. Whether the Giants would want to or even be able to trade Moore is another question, but the possibility will be open through season’s end. Moore would have to be traded to a new team today in order to be eligible for that club’s postseason roster, though from a purely speculative standpoint, a non-contending club could look to buy low on Moore with an eye toward the 2018 campaign. The 28-year-old has struggled through the worst full season of his career in 2017, logging a dreadful 5.49 ERA with 7.7 K/9, 3.3 BB/9 and a 37.4 percent ground-ball rate in 154 innings of work. He’s been somewhat better since the All-Star break, but Moore’s stock is still at a low point. He has a $9MM option for the 2018 season and a $10MM option for 2019. Top prospect David Paulino (mentioned by Luhnow as an “important piece” in the McTaggart interview above) made his 2017 debut at Triple-A Fresno after missing five weeks with a bone bruise in his elbow, as Jake Kaplan of the Houston Chronicle writes. Paulino finished the 2016 season in the Majors and opened the season on the Major League disabled list, so he’s technically pitching on a rehab assignment. Based on Kaplan’s writing, it doesn’t sound as if Paulino will be an immediate option for the team once his rehab clock is up; Kaplan notes that he’ll eventually be activated and formally optioned to Fresno. In the meantime, Paulino will continue accruing MLB service time. In light of Rosenthal’s Devenski column and Paulino’s return to the mound, I’ll also point out that Paulino was acquired as a player to be named later in a trade for a reliever; Houston nabbed Paulino, who entered the season as a consensus top 100 prospect, as a PTBNL in the 2013 trade that sent Jose Veras to the Tigers. At the time, Paulino was a 19-year-old GCL prospect that was rehabbing from Tommy John surgery. He’s very clearly elevated his stock, having tossed 90 innings with a flat 2.00 ERA, 10.6 K/9 and 1.9 BB/9 across two minor league levels in 2016 (plus five more shutout innings in the Arizona Fall League). The Astros have decided to call up right-handed pitching prospect David Paulino, according to Jake Kaplan of the Houston Chronicle (via Twitter). Because he already held a 40-man roster spot, no corresponding move will be required. Paulino, a towering 22-year-old righty, drew top-100 prospect consideration entering the year from Baseball America. And he has largely continued that momentum, improving to 47th on BA’s midseason top 100 and rating as MLB.com’s 76th-best prospect in the game on their own midseason rankings. The appeal here is obvious: Paulino has a huge frame and a mid-nineties heater to go with a quality curve. His third pitch, a change, is somewhat less developed but seems to hold the promise of being a useful major league offering. Paulino comes with a big ceiling, scouts say, but it remains to be seen how the entire package will translate at the major league level. Paulino has impressed thus far in 2016, at least when he has been on the mound. He served a suspension for a violation of team rules in the middle of the year — the situation remains murky — meaning that he has only accumulated 90 total frames on the season. That still rates as a career-high for a hurler who had undergone Tommy John surgery before he was sent from the Tigers to the Astros as the player to be named later in the Jose Veras trade. Despite that hiccup, Paulino obvious did enough to convince the Astros brass that he was worthy of a shot at the majors. He burned through Double-A, posting a 1.83 ERA with 10.1 K/9 and 1.5 BB/9 over 64 frames, earning a bump to the highest level of the minors. Though Paulino has allowed 16 hits and six earned runs over his 14 frames (spread over three starts) at Triple-A, he has managed to compile an appealing 20:6 K/BB ratio. For the ’Stros, it’s hard not to wonder whether there’s at least some connection between the move and the recent loss of staff ace Dallas Keuchel. While Paulino’s precise role remains unclear, the injury to Keuchel may have made the organization more willing to roll the dice on an unproven arm — whether in the rotation or some kind of relief role. Even if it is somewhat sub-optimal to rely on Paulino at this stage, he certainly delivers some upside and didn’t require any roster maneuvering. As for service-time considerations, the move will obviously get Paulino’s ticker started. If he opens the 2017 season in the majors, then the extra days of action will have no impact. If, however, the Astros decide they’d like to further delay his free agency, then time spent in the bigs this season will extend the number of days he’d need to stay down next year. Angels GM Billy Eppler is non-committal about his team being sellers at the deadline, Pedro Moura of the Los Angeles Times writes. “Let’s let this club play a little bit longer. There’s no rush to make a decision right now,” Eppler said. The front office wants to “get the full team intact and guys back on the field and healthy” before making any decisions, Eppler said, though Moura points out that this will be impossible given how many key pitchers are either out for the season or indefinitely shelved. It could be that Eppler is simply engaging in some gamesmanship, as the Halos’ record (31-44, last place in the AL West) would certainly indicate that they’ll be selling come August 1. Don’t look for the Athletics to trade reliever Ryan Dull, Susan Slusser of the San Francisco Chronicle tweets. Dull has been a bright spot for the A’s, posting a 2.31 ERA, 9.7 K/9 and 5.25 K/BB rate over 39 bullpen innings this season. The 26-year-old is under team control through the 2021 season, so it makes sense that Oakland hang onto Dull and instead focus on older players closer to free agency as possible deadline trade chips. Astros pitching prospect David Paulino has been suspended by the club for an undisclosed period of time, Jake Kaplan of the Houston Chronicle reports. “We’ve got rules and every once in a while rules are violated and we have to enforce them,” GM Jeff Luhnow said, though he noted that Paulino’s violation “wasn’t anything major” and the 22-year-old righty won’t be out of action for too long. Paulino, ranked on top-100 prospect lists by Baseball America (91st) and MLB.com (98th), has a 1.86 ERA, 10.2 K/9 and 6.0 K/9 rate over 58 Double-A innings this season, with eight of his 13 appearances coming as a starter. Sam Dyson has emerged as the Rangers’ closer but is also tied for the league lead in appearances. As Gerry Fraley of the Dallas Morning News writes, this is an untenable situation for any closer, especially one with a checkered injury history like Dyson. The logical answer is to limit Dyson’s innings, though that could be difficult with Texas in the thick of a pennant race. The Rangers are known to be exploring bullpen upgrades, and they could even replace Dyson at closer if the Yankees made Aroldis Chapman or Andrew Miller available.